£5 per session. This is deducted from your annual membership if you decide to join the club. Annual membership is £30, or £20 if unwaged or a student. Any payments made for taster sessions will be deducted from your 2019 membership if you subsequently decide to join. Unique opportunity to row in a community built traditional currach. Open to people of all abilities and ages (12+). Vulnerable adults and children MUST be accompanied by a responsible adult or carer. If you are concerned you won’t be able to take part just drop us an email for a chat. A great activity for all, partially sighted and blind people welcome. An opportunity to mix physical activity with socialising and a unique view of Belfast and the River Lagan. 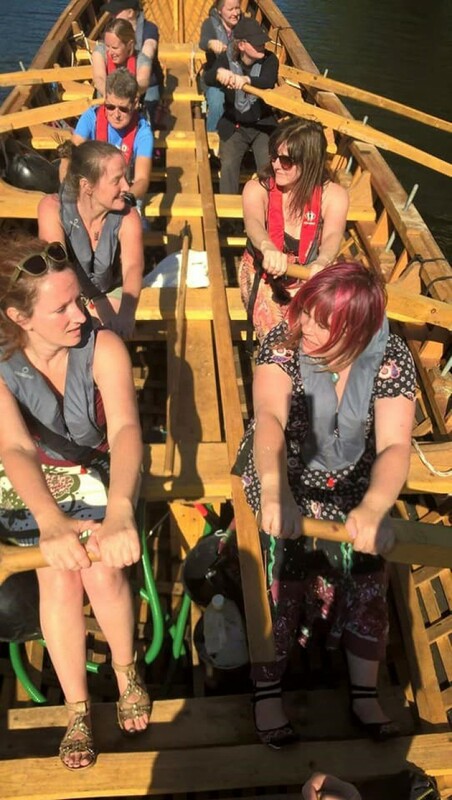 Come and experience the exhilaration of being part of a 12 person crew rowing a beautiful, community build traditional currach right in centre of Belfast. Learn new skills, make new friends, and enjoy the spectacle of our beautiful city from a different angle. Participants will be given the opportunity to learn and experience rowing a traditional currach on the River Lagan, and learn the basics of rowing techniques, basic river safety language, and can try their hand at the steering oar. and choose the day and time slot you prefer. 1 hour taster rows. All equipment provided including tea and biscuits! We live in the city of hourly changing weather conditions. Come well prepared with warm and waterproof clothing, sunscreen and a hat if the sun is out, and a bottle of water for hydration. Suitable for all adults and children 12+. Younger children may be accepted – Just talk to us first. All vulnerable adults and children under 18 MUST be accompanied by a responsible adult or carer.